Creates and manages your enterprise structure. 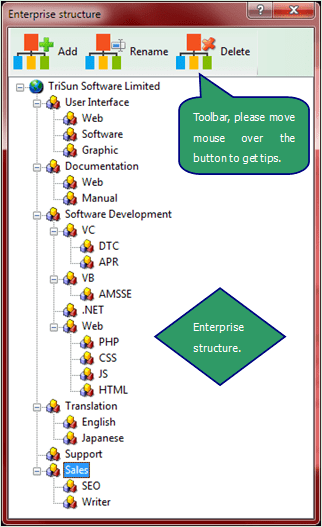 Click 'Persons -> Enterprise structure' module link on the main interface. <Add> - adds a sub department under the selected node <Ctrl+N>. <Rename> - renames the selected item <F2>. <Delete> - deletes the selected department and all its sub departments <Del>.